AMC White Mountain National Forest Map & Guide, cartography by Larry Garland, 3rd Edition, 2017. 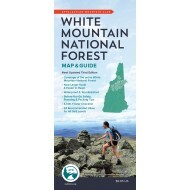 New larger scale, easy-to-read edition of this large waterproof map provides an excellent overview of the Whites, presenting the entire National Forest, plus the Mahoosucs, on two sides, with all trails shown with mileages between points and 200-ft. contours. This is a good map for keeping track of 4000-footer ascents, redlining trails, or other White Mountain hiking projects. Includes checklist of 4000-footers safety planning info, and 24 recommended hikes for all skill levels. Scale is 1:95,040. Folded to 4" X 9."